Abarth makes a faster Fiat. 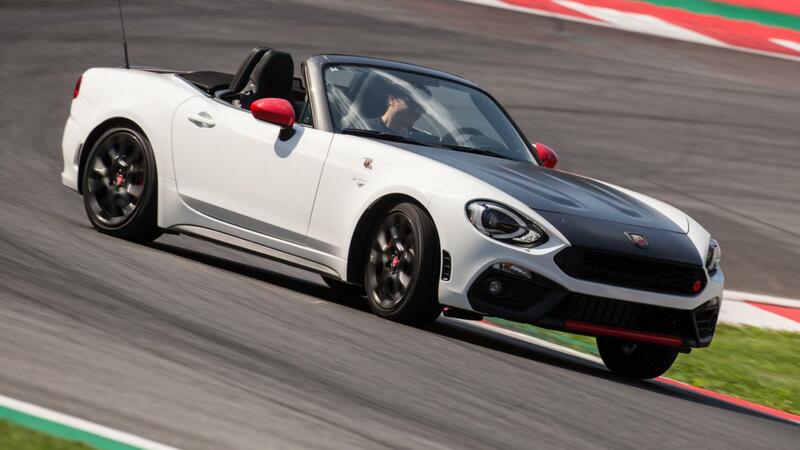 So to create the car you see here, the Abarth 124 Spider, you might assume the starting point was Fiat's 124 Spider. And you'd be right. But that's not the start of the story, because Fiat's starting point was the Mazda MX-5. We apologise if this is familiar ground, but it's worth everyone knowing the full facts because they will become relevant later on. 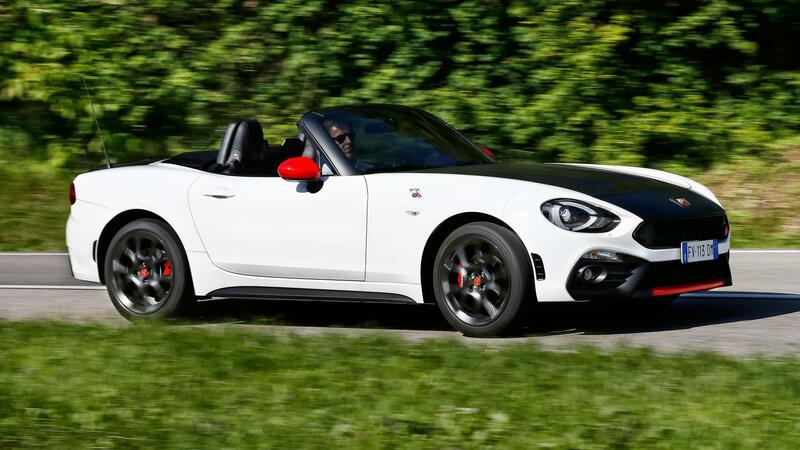 There's more to the Fiat/Abarth 124 Spider than just a new set of clothes. It's a fairly comprehensive overhaul designed to give the Italian car a different vibe to its Japanese counterpart, and includes different suspension settings and a turbocharged engine, where the Mazda is nat asp only. In the Fiat the 1.4-litre four cylinder turbo develops 138bhp, while for the Abarth it's turned up to 168bhp - good enough for 0-62mph in 6.8 seconds and a top speed of 144mph, emissions of 148g/km (that put it in tax band F) and a claimed 44.1mpg on the combined cycle. We'll see. 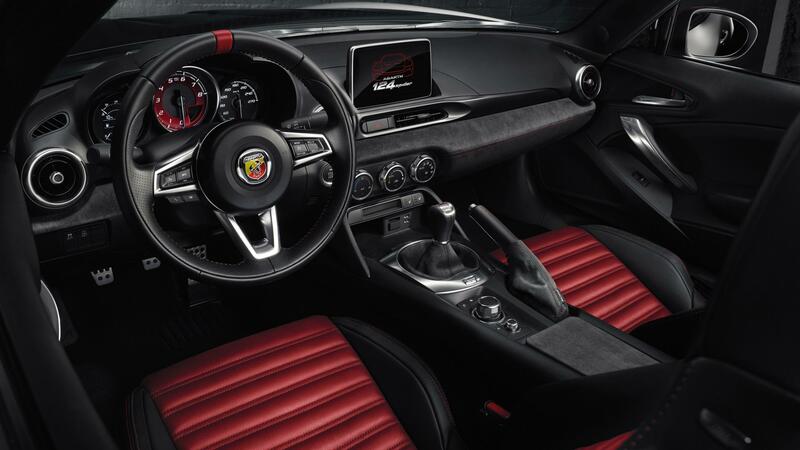 Make what you will of the styling, but we will say this - the Abarth has been successfully sportified and that does help distance it from the usual jibes. OK, I can't leave it there. Fiat may claim it harks back to the original 1966 124 Spider, but compared to the neat, pert, sweet'n'swoopy MX-5, this does look rather heavy-handed. 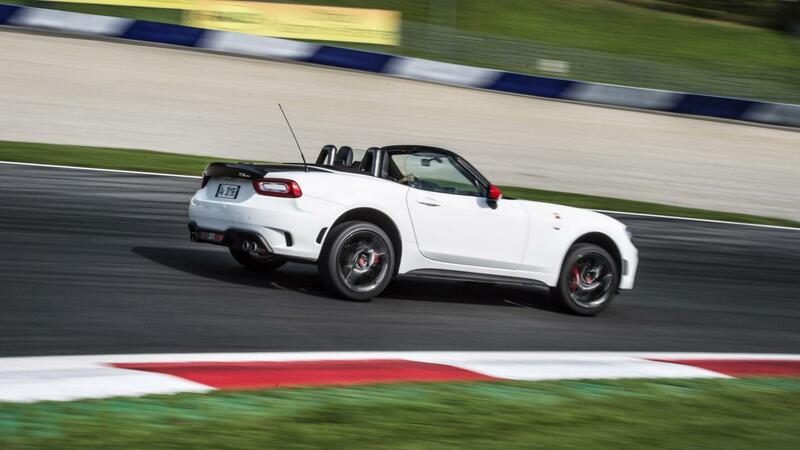 But a roadster is a simple car so let's not overthink this - the Abarth is a front-engined, rear-drive, manual-gearboxed, manual-roofed two-seater that wants to show you a good time. Just one more fly in the soup before we go any further - it costs £29,565. That's not a small price. You can drive an Abarth Spider every day. It's size, snappy gearbox and quick steering make it easy to thread around town, while the well-shaped seats and refinement enable it to see off a couple of hundred miles without too much tinnitus or backache. On B-roads, where you want to have fun, it is entertaining. It's light and nimble and accurate. It's not bad, it does the job. But on the whole it doesn't do it quite as well as the MX-5. By making it stiffer, the Abarth feels less supple than the Mazda. A fraction more grippy and less prone to roll, yes, but it doesn't have the same fluidity, and the sharper settings make it feels slightly snatchier. Now it might well be that you prefer this extra dab of aggression, the more attacking front end, and that's fine - it would be no good if the 124 was just a blueprint of the MX-5 - but the overall dynamic impression you get is that this one is a little less polished. The Mazda fills you with this warm sense of everything carefully honed to work together, while there's something slightly distracting about the Abarth. It's not as fulfilling and rewarding as you want it to be. I'm not convinced Abarth dotted every 'i' and crossed every 't' before waving it out the door. Most potential buyers might not care about this, happy in the knowledge they have a small roadster that's more masculine than an MX-5 and does the job of blatting about with a spring in its step. And in one key area the 124 Spider does have leverage over the Mazda - it's engine. Mazda has stuck doggedly to natural aspiration, its most potent 2.0-litre developing 158bhp and 147lb ft at 4600rpm. It's a sweet enough unit, but widely criticised for not delivering hot-hatch matching acceleration. The Abarth's smaller (1.4-litre), single turbo motor isn't that much more powerful (168bhp), but the turbo's torque gains are significant in a car that only weighs a little over a tonne. It churns out almost 40lb ft more (184lb ft), and delivers it over 2,000rpm earlier (2,500rpm). Because the engine is light and small and the air paths are short, there's not much inertia to overcome, so turbo lag is barely noticeable. You don't have to row the gearlever about so much (almost a shame, as it's a reward in itself) and can instead let the engine go to work. It's less stressful, and while it's still going to struggle to keep a Golf GTI in sight, the extra slug of power over the Mazda is useful. If not particularly tuneful. At low revs, the exhaust parps and farts, but as speeds rise you leave the noise behind, and are left without a flat, ordinary four cylinder. Pressing the Sport button doesn't alter the exhaust on UK cars, merely gives you a different engine map that sharpens the throttle and has an overboost function for the torque. You notice the former, but not the latter. The little Brembo brakes are strong, and as with the MX-5, the driving characteristics match the visuals pretty well. But the impression you're left with after a drive is a car that needs just a little more time and effort spent on it - to make it feel more cohesive, to sweeten the mid-corner balance, to get a bit more steering feel, to join the two ends of the car together better so you, sat at the back, feel more in touch with what's happening up front. But these are probably only criticisms if you're an enthusiast, and I'm not sure this is an enthusiast's car. The Abarth doesn't feel a small car. I hate to keep harking back to the MX-5, but where the view down the Mazda's bonnet is pert and shapely, here the broad, flat expanse reminds you you're driving a car with more bodywork around you - and yes, the Abarth is a little wider, a little taller and a lot longer. It's also a lot more overtly sporting inside. A red rev counter, red band on the steering wheel, red stitching, alloy pedals and heavy use of alcantara do set a certain tone and make the most of the otherwise lacklustre cabin design. The plastics are OK, the quality fine, but it's not going to blow you away beyond being simple and relatively ergonomically friendly. It earns bonus points for the roof, which is so simple and fast to manually raise and lower without having to leave the comfort of your seat. The boot is small, but you'll cope because you're buying a roadster and you know what you're getting yourself into. More of an issue is the driving position. As is often the case, it's too high, leaving the lanky feeling exposed and struggling with leg clearance under the steering wheel. It's OK for the rest of us, but the seat isn't the most supportive and in this day and age reach-adjustable steering isn't too much to ask is it? Couple of last little bits. Like the MX-5, the infotainment isn't the most advanced graphically or functionally, but it's easy to get to grips with via the pad on the console. More of an issue is that every time you go round a right hand corner with a bit of verve, you'll need to flap the wipers because screenwash has gushed across the windscreen. Here's where we get to the sticky point. As a small roadster there's not too much wrong with the Abarth, until you get to the price. It's £29,565. A top line MX-5 which is just as well equipped and only half a second slower to 62mph is £23,690. That's 20 per cent cheaper. Imagine what you could put the £5,875 you'd save towards. Now, I'm aware the Abarth will be a rarer sight on the roads, and that the brand is newer and sportier and more exciting, but £30k should get you more car, more quality, more speed, more handling - or if not all, at least some combination of these. Maybe you don't plan on buying your car outright, but instead intend to lease. Well it's the same story - depending on how much you put down in advance, what the lease period is etc, the MX-5 will work out at about 20 per cent less per month. Expect to pay £320-470 per month for the Italian roadster, against £260-350 for the Japanese. On the positive side, the Abarth's turbocharged engine is efficient. CO2 emissions of 148g/km put it in tax band F (one below the MX-5, so saving £40 per year), and in a bit of easy mixed driving it will do 37-38mpg, 3-4mpg more than an MX-5. Clog it and the turbo's thirst will drop that below 30mpg, but on the whole the engine does a good job of keeping its promises. Couple of spec pitfalls to watch out for. The automatic gearbox is £2,050 and should be avoided like the plague - not only because the manual is a light, simple delight, but because it'll hit residuals, too. The only standard colour is black, everything else is charged for and the Heritage Look offers a black bonnet as a no cost option. You might like that. Colour choice is good, too. 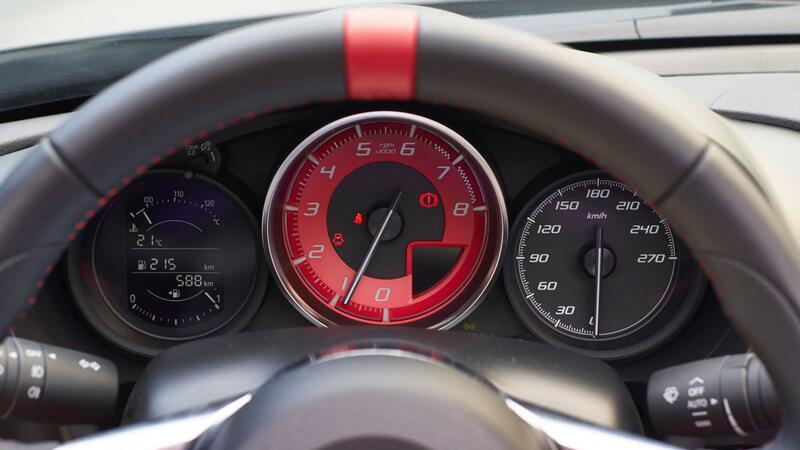 Provided you don't ask too much of it, there's a lot to enjoy with the Abarth. It's got a wide spread of power, it's a good-natured daily driver and looks and feels suitably sporty. But for the amount Abarth is charging, the 124 Spider isn't good value. Perhaps if more attention to detail had been put into the driving experience, to make it feel more special, to give the engine more charisma, the handling more deftness, then it wouldn't feel such a stretch. But at this price you have lots of tempting options to consider: Audi TT Roadster, Nissan 370Z, BMW 220i Cabrio, Ford Focus RS, Mercedes SLC, VW Golf R. There's some good kit out there. Read more on Top Gear.